Right and Left LED arrays indicate sequential turn signals. These super bright LEDs (8500 mCd) have a wide viewing angle of 180 degrees. They are sunlight readable, even from the adjacent lanes. A cluster of (6) LEDs is magnified by an acrylic lens to broadcast the Deceleration Warning sequence. As soon as you tap the brakes, they modulate rapidly at first then slow down to a solid ON over a period of (4) seconds. This is a programmable feature. For additional visibility, all LEDs stay ON at reduced intensity, but you can also turn this feature Off. The frame is die cast alloy for strength and durability. Polished chrome finish to match cruiser trims. 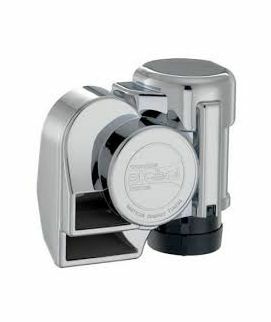 Select the Optional Mouting Plate and hardware to update the installation in all chrome. Designed to accept the most commonly used 7-1/2" license plates. Draws very little current (3/10th of an AMP), so it does not interfere with integrated ABS or EVO brake systems. 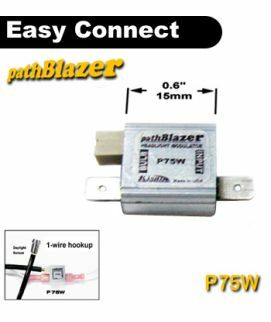 Requires connecting to the turn signal and brake wires. 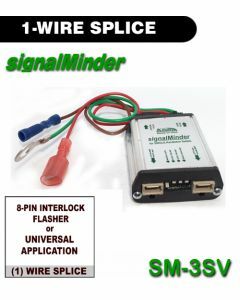 You do not have to cut any wires, if you use the Scotchlok (T-Tap) connectors, which are also supplied. 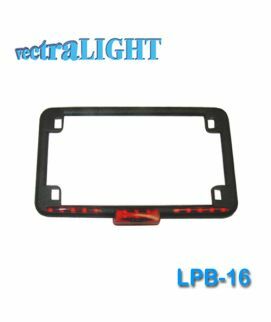 vectraLIGHT LPB-16 can be mounted with the LED arrays on top or bottom of the license plate.